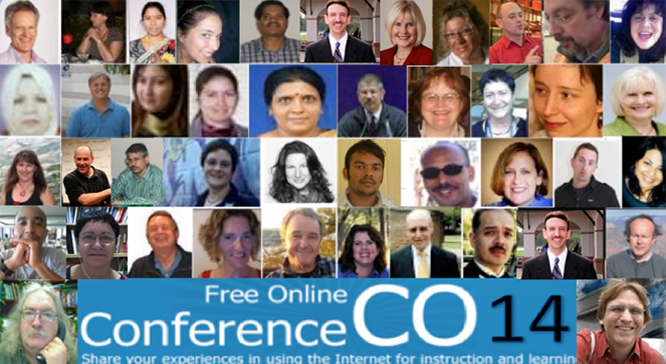 CO14 represents the 5th annual connecting online free conference with the theme of connecting online for instruction and learning. The free online conference will take place February 7-9, 2014 on WizIQ. The presenters of CO14 will share educational technology, teaching and learning techniques and how they connect online for instruction and learning. You’re invited to join the 5th annual Connecting Online CO14 (see Conference Area ). The theme of the current free conference is connecting for learning. What worked and what didn't work for you? Sunday February 9 5 PM EST Janet Bianchini Visually Inspire Your Learners! You are cordially invited to participate for free as a participant and/or a presenter at the annual free online conference on the weekend of Feb 7-9, 2014. Each presentation will be for 45 min with 10 min for questions and answers.